Today, the houses and apartments are getting smaller and to have a nice place to live, you must take advantage of every available square meters. One of the most undervalued areas is under the stairs. In it, you can create different spaces with a multitude of functionality, and a great way to use this place as it had stood empty. According to the coordinator of the course Design Educational Center of Interior Design and Intelligence (Nedi), in Belo Horizonte (MG), Flávia Bizzotto, this space shall be reused mostly in homes with few square meters. "We can then install various kinds of furniture for different purposes. Cabinets, bookcases, shelves, niches, wine cellar, bar, home office, space for reading, kids room and even a garden, "he suggests. Creatively, you can create any corner that meets your need. it is misleading to believe that the place under the stairs can not be tapped. "By its volumes, the ladder will always provide this condition, but how we will be able to enjoy this space will depend on its size, shape and angles," says Flavia. 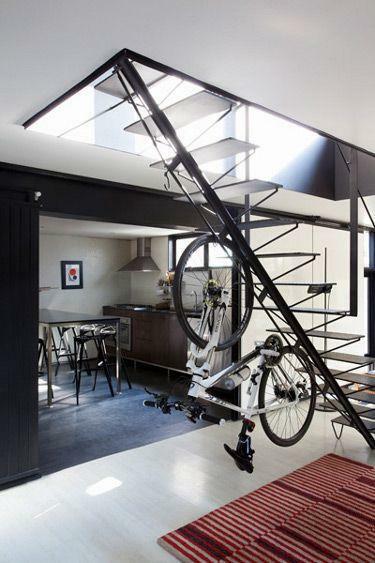 Therefore, each type of ladder will offer a possibility, from those that offer small spaces beneath it, even the less angular stairs that allow a better use of the site. As for the material, the architect and professor of the Institute of Ribeirão Preto Construction, Fabi Rodrigues says that the masonry stairs are the best options. "For better optimization of space, the best option is the masonry stairs, because it enables the transformation of the site into new rooms," she adds. For those who are building a ladder, the hint that gives the coordinator is to evaluate what use will be given to the space under the stairs. 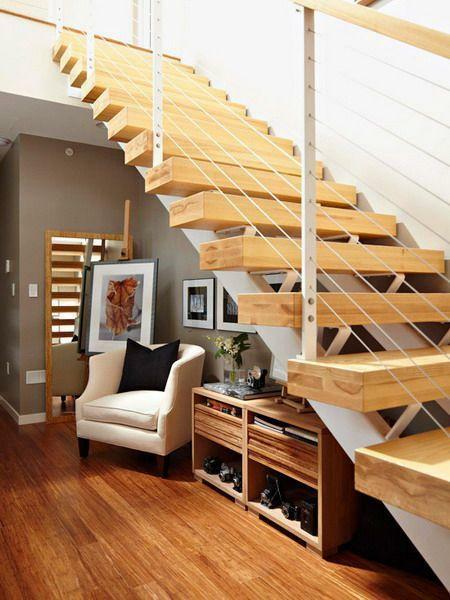 "Overall, the straight stairs with one bid offering the best options," he says. So, if you want more space, give preference to this type of ladder. 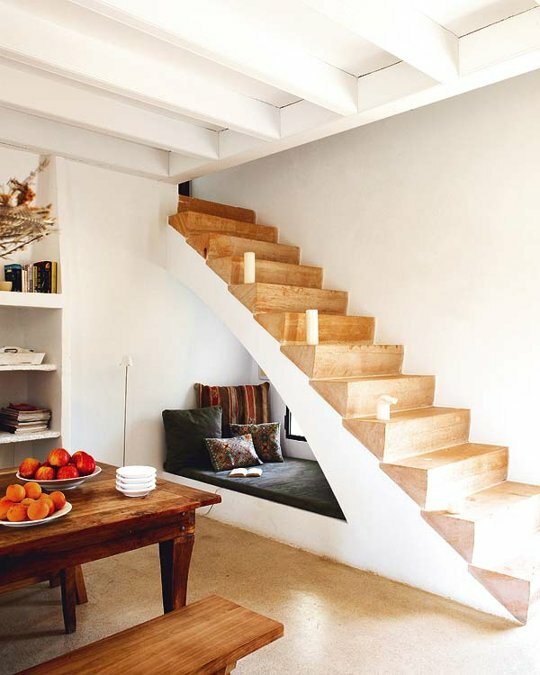 A corner under the stairs can be taken advantage of, from the smallest, with few square meters and low stature, to the spaces under the less angled stairs, offering a large area to give the desired purpose. 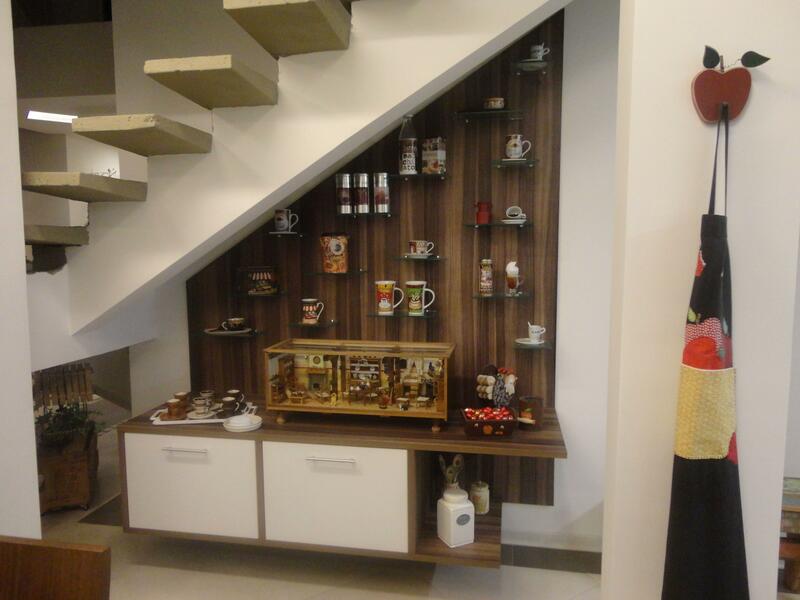 So with the help of the coordinator of the course of Interior Design, following a guide with various ideas and tips for you to create the best space under your stairs. You can make an office for your home using the area under the stairs. A tip given by Flavia is to enjoy the highest space to put a table and chair and the lower space of the ladder to the files. By working sitting, no problem in relation to the height of the staircase. 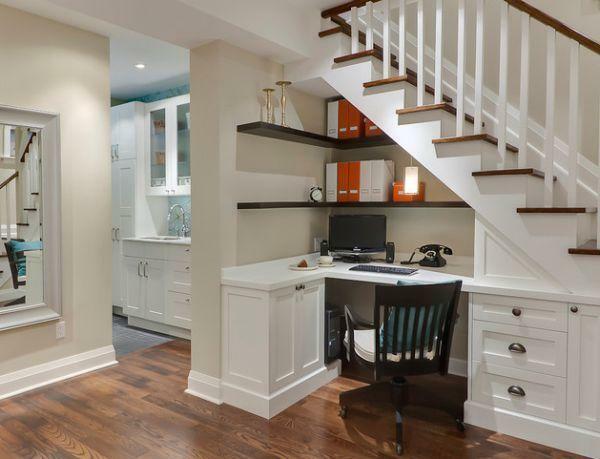 In this case, the best option is a straight staircase of a bid only, so that you have more room to create your home office. It seems unlikely, but the space under the stairs is a great place to make the toilet of his house. 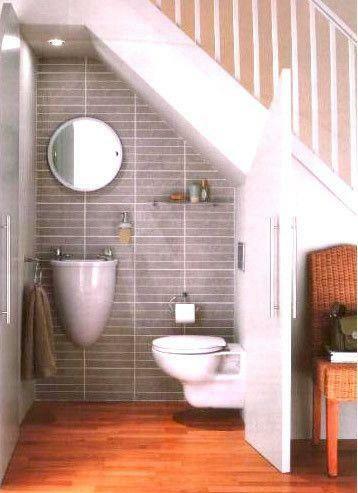 Being a small bathroom, no shower and not have to be spacious, it fits perfectly under stairs with reasonable areas. In addition, the toilet usually stay on the first floor, and the bathroom used by visitors, and therefore be under the stairs is a good option to optimize your residence. 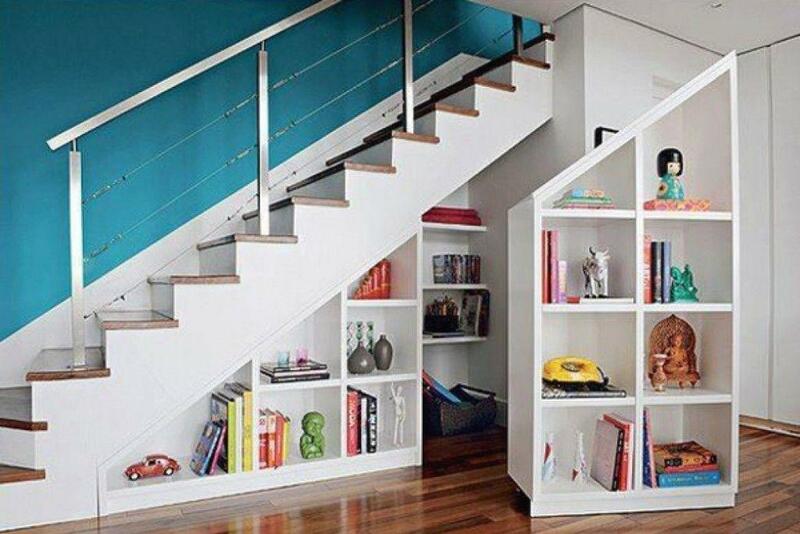 Another good option to do under the stairs is to create a bookcase. Both larger and more stairs straight as in fuller stairs curves, you can take advantage of the space to create a place for your books. 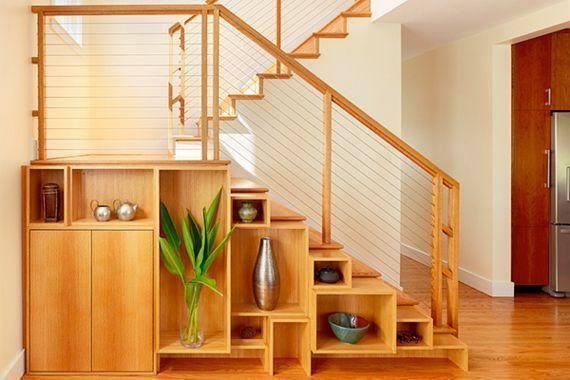 One idea is to take advantage of the stair steps to create own shelves. "If the staircase is made of wood, you can plan the woodwork in a way that it can house a bookcase, a rack for TV, or even a closet, integrated into the steps and providing visual uniqueness," says Fabi. 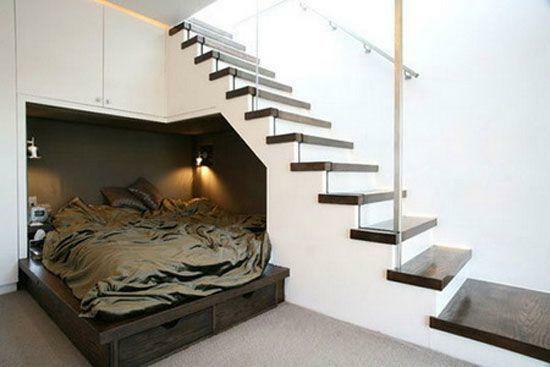 The space under the stairs is ideal for those who love to read. In addition to house the books, this corner can also be used to put an armchair, a good light and turn the ideal place to take readings. "With the help of good lighting this space can be a haven for compulsive readers. A comfortable chair, a cozy rug and many books close at hand, "teaches Flavia to assemble the perfect reading corner. Children deserve a special environment and only them in the house and there is no room left for it, the space under the stairs is the perfect place. "Who in their childhood no longer teased 'small hut'? Children like the idea of ​​hiding and how for them to squat is no problem, probably the whole area will be utilized, "explains Flavia. straight stairs help to leave more room for children to enjoy until they are larger. Having house plants helps to make it more fresh and cheerful and for those who do not create space for a garden, you can take the stairwell. 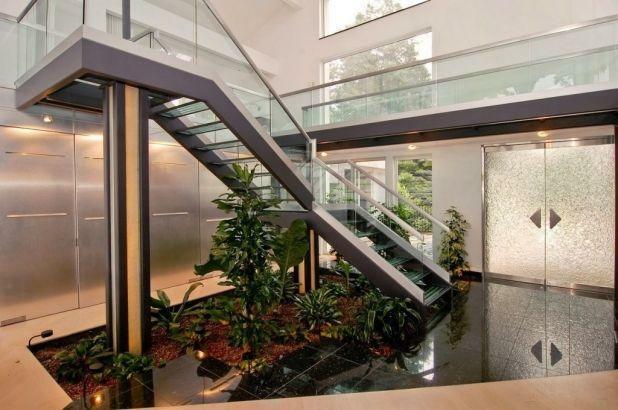 "The use of areas under the stairs as gardens is also widely used. In this case, one must be attentive to some details that may interfere with the growth and development of the species. Natural light is essential as well as good drainage and irrigation system, "says Fabi architect. But for those who have stairs in a less fresh air, there is the possibility of installing vessels and have a more practical garden, as suggested by the architect. 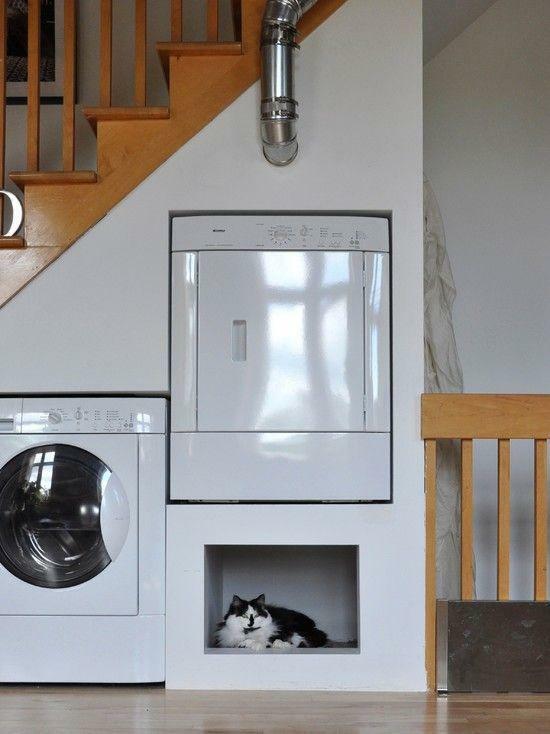 If the right foot of your stairs is small and is not feasible to create environments for the height of a human being, why not give your pet a house? Because they are small and walk on all fours, the space under the stairs ends up being a great alternative to the house of your dog or your cat. You can create a space of ideal size of your pet and make your pet very happy to also have your house. In most homes, always missing a closet to store a towel, a sheet or bag, so the space under the stairs is the ideal place for you to install more cabinets in your home. There you can put anything that is not fitting in the other cabinets, from household appliances to bedding and bath. Enjoy the height of the staircase to make cabinets the size of your need and save them all you need, leaving your home more organized. A fun and different place for you to do under your stairs is the bar. "Put the lower bench (with the height of a table) and chairs or ottomans. In part under the lower rungs decorate with something of interest "is the tip of the coordinator Flavia. "You can organize drinks as well as cups, glasses and cutlery, and is very useful for those people who like to entertain friends at home. Also, turn this space into a bar creates a new and pleasant point of interest to the residence, "says Fabi. 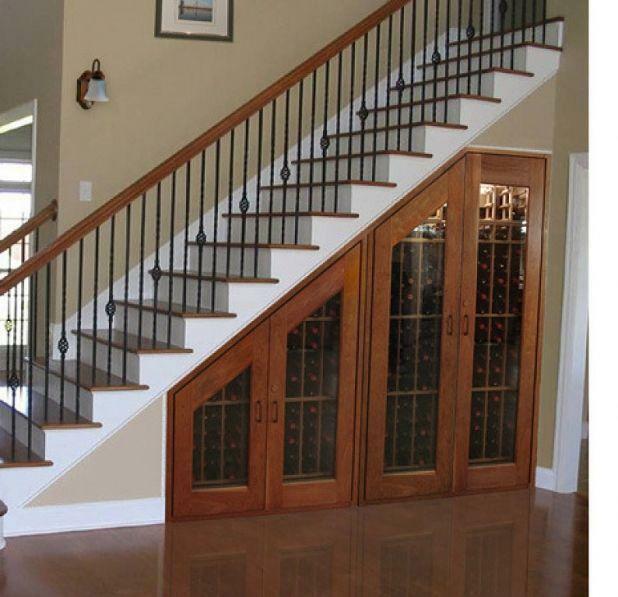 For wine fans, there is the option to install a wine cellar under the stairs. Stuff is something that does not lack in every home. Picture frame, photo album, vases, CDs, DVDs, etc., all this along with a bookshelf, you can create an interesting environment under the stairs. The idea is to use creativity to make a full shelf of junk, but organized to create a decoration and a place to store these items that often are thrown out the house. You can also take advantage of the openings of the ladder to create the shelves of his bookcase. Options to save your stuff is not lacking. 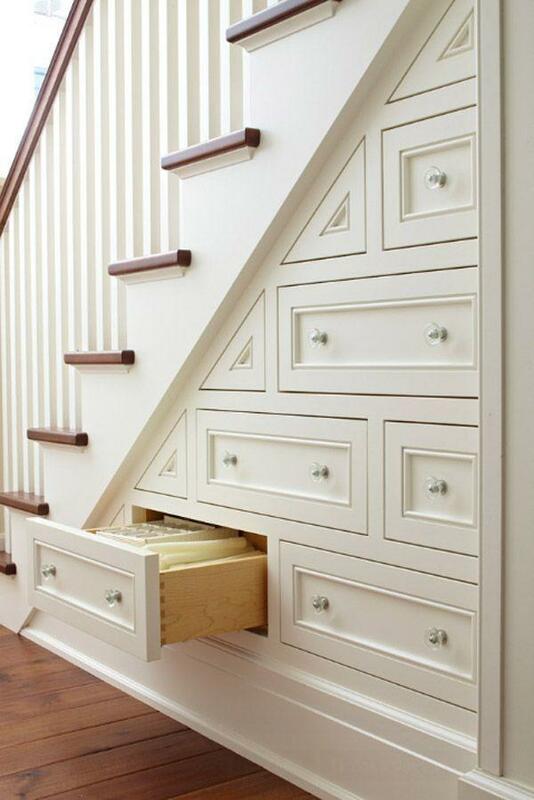 Besides being able to put cabinet and bookshelf, you can also use the space under the stairs to install drawers. It's a great way to let your sectored belongings and stored at the same time. In each drawer place objects of a specific place in the house, or leave a drawer for each family member, so no one will lose nothing and still takes advantage of the space under the stairs. If your staircase is straight and has a suitable height, there is the possibility of installing the trimmer television under the stairs. "If the sofa can stand in front will be a great space for TV. Just will not be very comfortable if the movement of people there is very great, "says Flavia. Given these specifications, you can install your television and create a charming and cozy environment for your room and also for your ladder. 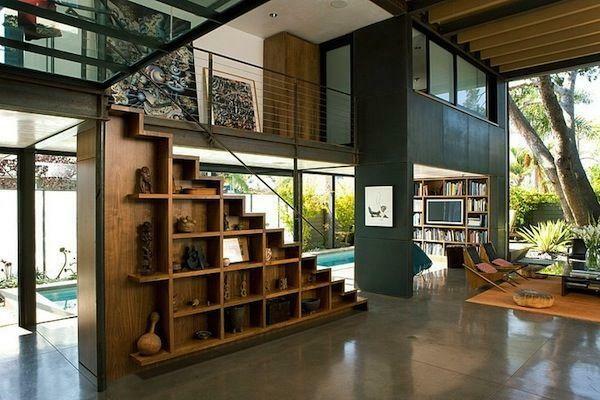 Not only the TV may be in the space under the stairs, as well as your couch. 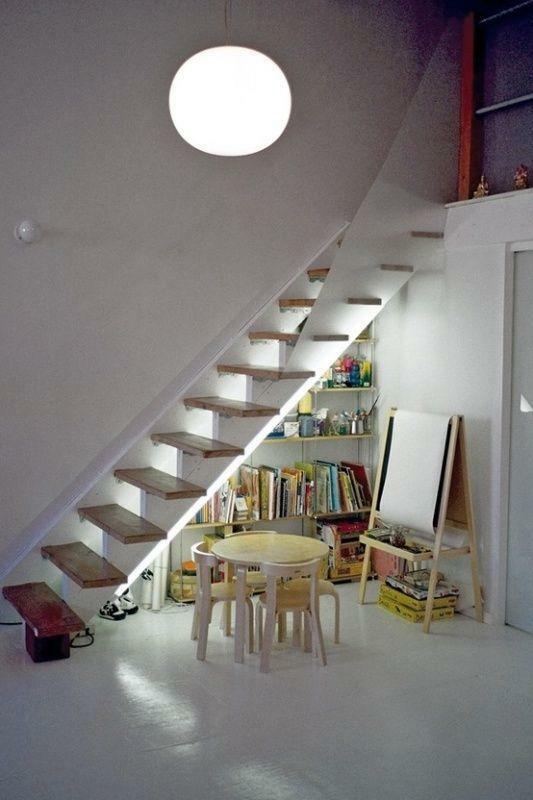 As people get it or sitting or lying down, there is enough time under the stairs to accommodate them. Thus, there is a possibility you create two environments: a very warm visit room to receive your guests, or a TV room for you to enjoy and watch your favorite programs. You can also put chairs and a carpet, to make the perfect setting for your rooms. A useful environment and allowing to be done under the stairs is the kitchen. 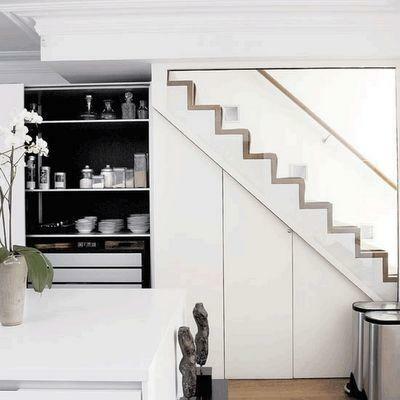 Depending on the height of your ladder, you can install stove, refrigerator and many shelves under your stairs. Other elements that need more space as the sink, can stay in another part of the environment. For the frying smell does not reach the top floor, close a portion of the ladder and give preference to materials, such as cement, to prevent the smell exceed the wall. 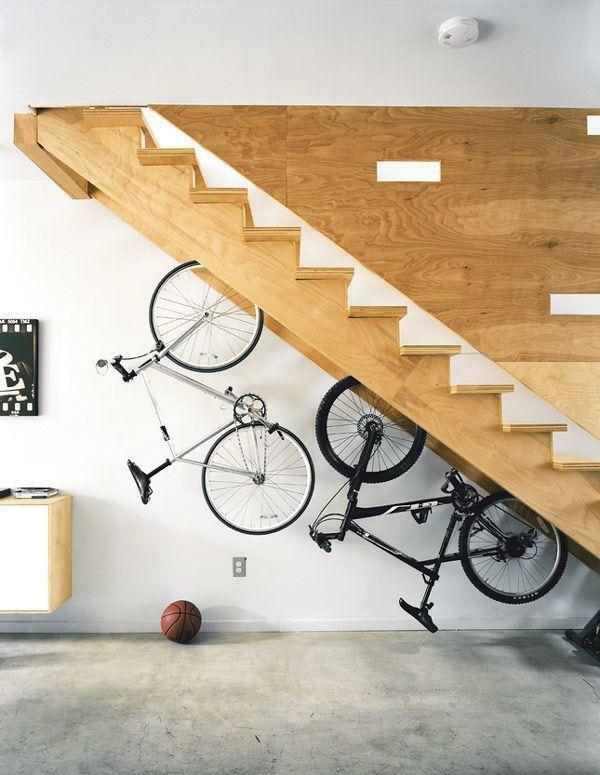 In addition to these options, there are plenty of creative ideas that you can use to take advantage of the space under the stairs. We selected some pictures for you to look, get inspired and build the space that best suits your needs.